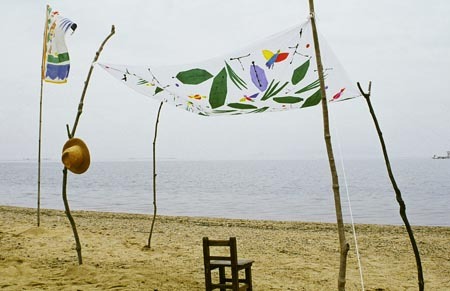 You can have a fashionable roofed tent with just one cloth, tightly spanning four sticks like this. If you put it on to the side of one stick, it's a flag when wind blows. If you wrap it around your body then it's Pareo, or Polynesian sarong. It's also a furoshiki to gather and wrap your items. You can enjoy your life with one free cloth always at your hand.